CONTENTS: Introduction by Michael Dirda; 'The Appointed Time'; 'Endless Night'; 'The Palace'; 'Out and Back'; 'The Wide, Wide Sea'; 'The Brink of Eternity'; 'Tourist Trap'; 'Northwest Passage'; 'The Hiding Place'; 'After'; Story Notes; Acknowledgements. For regular updates, please visit the Northwest Passages fan page at Facebook. Be careful what you wish for. Young men in search of adventure . . . explorers driven to investigate the ends of the earth . . . a girl trying to find the perfect hiding place . . . a curiosity-seeker drawn to an abandoned amusement park. All of them are looking for something—and unfortunately, they usually find it. For the very unlucky, it sometimes finds them! In these ten spellbinding stories by World Fantasy Award winner Barbara Roden, very little is as innocent as it seems; but much is haunting, enigmatic, and terrifying. Where the Twilight Zone ends, the Northwest Passages begin. UPDATE: 24 AUGUST 2010: NORTHWEST PASSAGES WAS THIS MORNING NOMINATED FOR A WORLD FANTASY AWARD FOR BEST COLLECTION! UPDATE: 13 NOVEMBER 2010: Books do furnish a room, and they make excellent Christmas gifts, for yourself or someone you love. Just think! They're conveniently shaped for wrapping, don't need batteries, and there's no assembly required. Don't know what book to get? Then look no further! 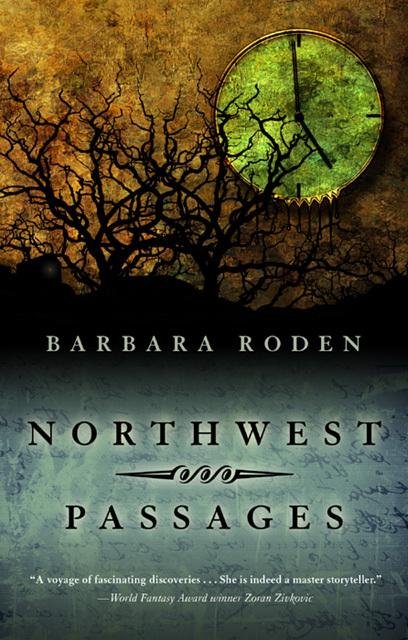 Northwest Passages, the World Fantasy Award-nominated collection by Barbara Roden, is available direct from the author. The hardback edition is US$25.00, and the limited lettered edition - which comes with a special chapbook containing the author's first published ghost story, 'Dead Man's Pears' - is only US$65.00 (prices do not include postage). But wait, there's more! As these copies are coming direct from the author, they can be personally inscribed to anyone you want, at no extra charge. Still undecided? If you act now, the author will include, completely gratis/free with each book purchased, the DVD-ROM of Forgotten Ghosts, the fabulously rare booklet originally published for the Ghost Story Convention in Chester, England in 1996. The booklet contained five rare stories included by legendary editor Hugh Lamb in some of his anthologies, along with the original story introductions, new introductions by Lamb, and a lengthy appreciation of Hugh Lamb and his work by Mike Ashley. The DVD-ROM includes all this material, as well as a photo gallery showcasing the cover artwork from Lamb's anthologies. It was produced for the World Horror Convention in Brighton in March 2010, and comes packaged in an attractive jacket reproducing the artwork from the original booklet. And if you order the limited lettered edition of Northwest Passages, the jacket of the DVD-ROM will be signed by Hugh Lamb.